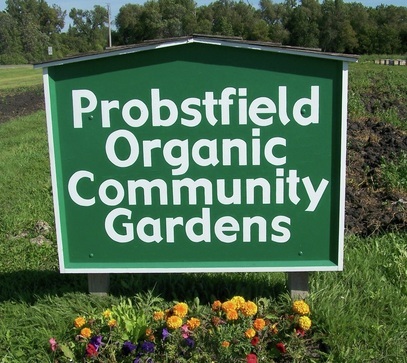 The Probstfield Organic Community Garden is one of the largest public community gardens in the Fargo-Moorhead area, with over 100 plots available to community members. During World War I, eager gardeners sought out vacant lots and other “slacker land” in cities across America and started community gardens. Community gardens provided a place for gardeners without land of their own to grow food. Groups of people could pool their resources for big projects like getting a tractor to plow a large area or setting up irrigation systems. In recent years, community gardening has experienced a resurgence in America. The Probstfield Organic Community Garden has over 100 plots maintained by gardeners from the Fargo-Moorhead area. The Probstfield Farm provided people in Fargo-Moorhead with fresh produce since the cities were founded, through World War I, World War II and after. The farm is still feeding people in our community today – many people just grow it themselves now. This entry was posted in GARDEN, HISTORY and tagged Community Gardens, Probstfield Organic Community Garden, Victory Gardens, War Gardens on April 17, 2013 by probstfield.